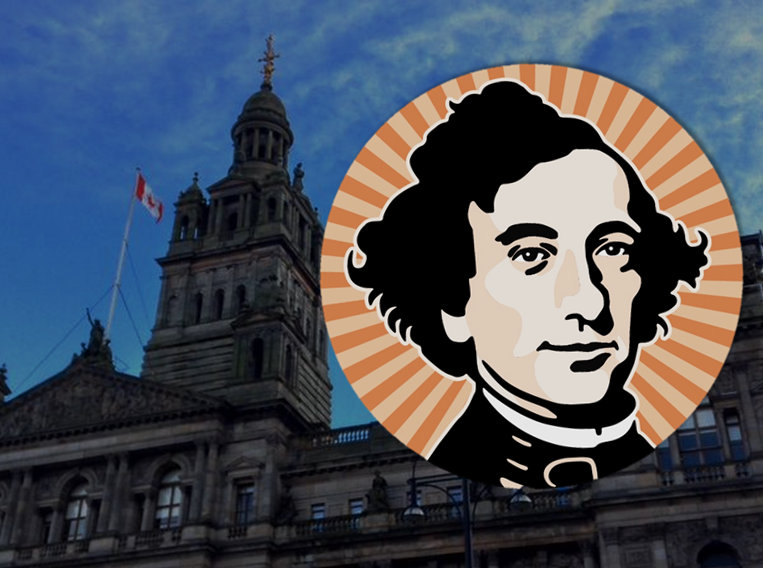 Yesterday, Canada and Scotland both rejoiced at the 200th birthday of John A. MacDonald (I refuse to apply the honorific ‘Sir’). 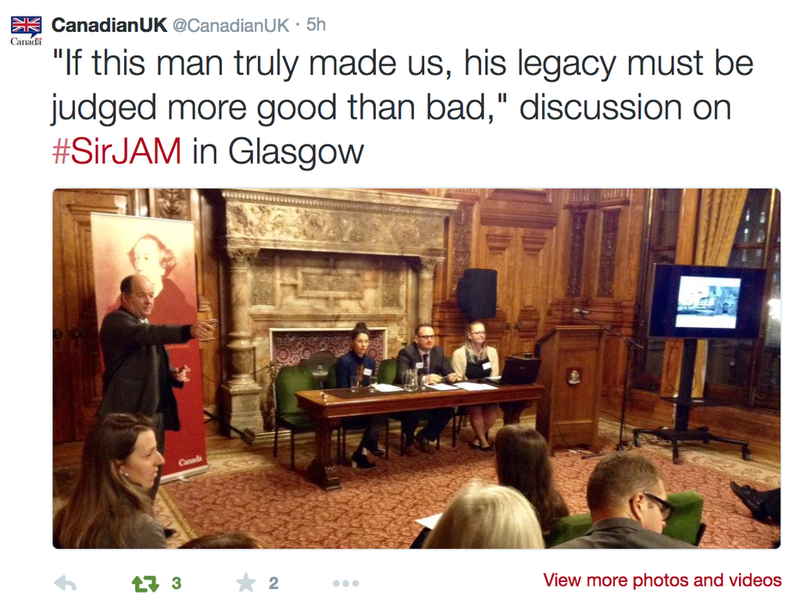 A jaunty conference on his legacy, funded in part by the Canadian High Commission in the UK and the British Association of Canadian Studies, was held at Glasgow City Chambers on Saturday. Its title was ‘Son of Glasgow, Father of Canada’. I have, through my time in Scotland, been keen to encourage a nuanced examination of the pride with which Scots tend to view their role in forming Canada. As a Métis (Indigenous) woman, I am emphatic that Scots must understand that their role in Canada’s history is not uniformly positive. Many of the worst parts of England’s Imperial colonialism in North America was carried out by Scottish actors. In this sense, John A.’s legacy must be viewed with care—and Scots must be willing to understand that in many ways, the oppression and dispossession that some Scots experienced at the hands of the English and wealthy landlords were recreated with startling and brutal fidelity upon sovereign Indigenous peoples in North America. I therefore offer a correction: the title of the conference and celebration may have been more accurately worded, for Indigenous peoples in Canada—which comprise First Nations, Inuit and Métis peoples–as ‘Son of Glasgow, Father of Genocide’. Indigenous peoples have long argued that MacDonald was a criminal at best, a genocidal despot at worst. There is very little ambiguity, now that ground-breaking research by Canadian scholars such as James Daschuk has been published and broadly disseminated in Canada, that John A. was ‘merely a man of his time’ or, as one trajectory of discussion during the conference reportedly suggested, as reported from the conference by the Canadian High Commission’s twitter feed on Saturday: “If this man truly made us, his legacy must be judged more good than bad”. I’ll explain why this argument does not hold water using the legacy of my own Scots-Irish settler-colonial ancestor, Dr. William Ernest Todd. I love Scotland. I voted in the Independence Referendum with an enthusiastic ‘yes’. I viewed this act as a moment of solidarity, to help right wrongs that Scottish people have experienced vis-à-vis the British State. My vote was a small act of healing not only for Scotland, but also for what some Scottish actors did to Indigenous peoples in North America. I came to study in Scotland four and a half years ago because of the tangled historical connections between Scotland and Métis peoples – my own roots are informed by the complex trajectory of a Scots-Irish surgeon named William Ernest Todd who moved from Dublin to Canada in 1815 to work for the Hudson’s Bay Company, the year John A. was born in Glasgow. However, any connection or resemblance between the two men ends there. Through his career as a politician, John A. implemented measures, as Daschuk argues, to ‘clear the plains’ through starvation; brutally repressed Métis expressions of governance and legal orders in what is now Manitoba in 1869-1870; or wholeheartedly embraced the practice of forcibly removing Indigenous children from their families to receive a ‘white’ education at Residential Schools. 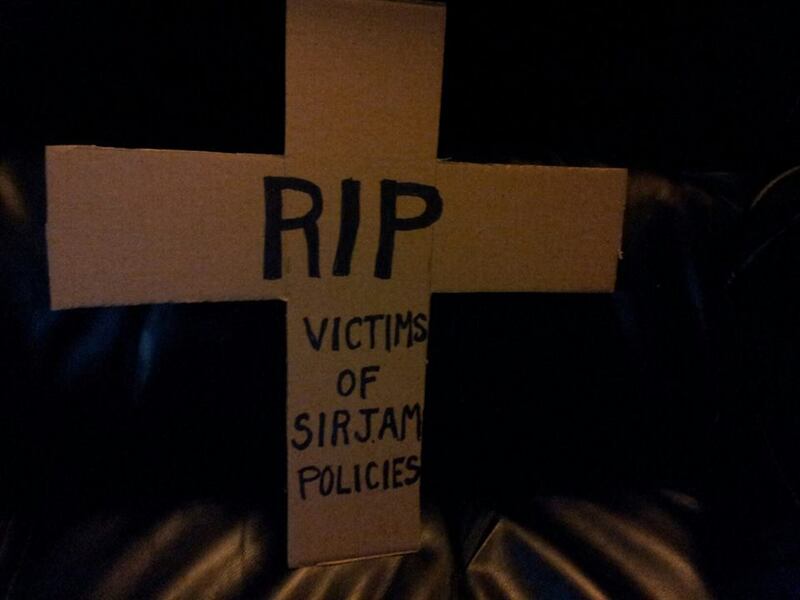 These legacies are rightly judged in both historical and contemporary fashion as deliberately violent and colonial. My ancestor, however, preceded John A. by a generation. In his work with the Hudson’s Bay Company, Dr. William Todd stood in stark defiance to racist attitudes towards Indigenous peoples so casually excused by some scholars and pundits today as ideological artifacts. Noted historian Arthur ‘Skip’ Ray has researched and written extensively about my great-great-great-great Grandfather William Ernest Todd. William married, ‘in the fashion of the country’ a Métis wife, Isabella (Elizabeth) Dennet, in 1824. Despite strong pressure from the English Governor of the Hudson’s Bay Company, George Simpson, for men of the Company to renounce their Indigenous ‘country wives’, William refused. Arguably this, amongst other reasons, cost him his advancement in the company. In 1837, William was a Chief Trader at Fort Pelly, in what is now Saskatchewan. He became alarmed at reports, from Indigenous people visiting Fort Pelly to trade, of a possible smallpox outbreak at the American Fort Union. As Ray reports, William acted quickly to disseminate vaccines to Chiefs and medicine men in the camps near Fort Pelly. He waited anxiously through the winter to find out if he had correctly identified the disease and its treatment. He was relieved when Cree traders reported in the spring that the vaccine had stopped the outbreak. I have read William’s journals at the Hudson’s Bay Company archives in the city of Winnipeg, Canada. Some could come to the cynical conclusion that he merely stopped the smallpox outbreak because it was good for the Hudson Bay Company’s business. I will never know precisely what his motives were, given that he is dead and all we have left are his writings. However, in reading his daily thoughts on the trajectory of the disease, there is a notable commitment to the well-being of the Cree (nehiyawak) and Assiniboine (Nakoda) with whom the Fort traded. If I may judge him as a man of his time, he used the tools he had available because he firmly believed in not allowing people to die or suffer needlessly. Whereas MacDonald, a generation later, long after my Great-great-great-great Grandfather’s death in 1851, would choose to deliberately starve and dislocate Indigenous peoples in order to make way for Scottish (and English and other European) settlers, William fought hard to stop death and disease. Of course, Todd did not act alone—Indigenous leaders took his medical advice on good faith and implemented the dissemination of the vaccines with trust that he meant well–and I do not mean this to be a sugar-coated tale of settler-colonialism. 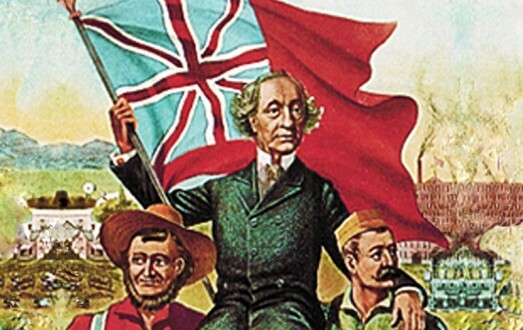 William was, undeniably, rooted in the trade and exploitation that informed the Hudson’s Bay Company’s operations, and this trade required the displacement of Indigenous legal orders and economies in favour of fur-trade mercantilism in order to profit. However, it is a hard pill for me to swallow to see intelligent people argue for MacDonald’s veneration when my own ancestor died bitter and broken, hampered in any further advancement in the HBC because English Governor George Simpson found him too argumentative to reward. You’ll excuse me if I politely decline in joining any convulsions of joy at Glasgow’s claims to John A. as a wayward heroic son. If anything, I would hope the people of Glasgow understand just how tragic it is to find ourselves on the receiving end of prejudice, violence and greed in the hands of a Nation State and its leaders bent on claiming your land, peoplehood and dignity. Proceed with caution, I say. If you want to claim John A. as your own, know that he brings a whole lot of colonial baggage with him. Leaves me wondering how my Scottish ancestors behaved here in the states. Many were good husbands to Native women. It is said native women took them in part because they understood genocide and PTSD. There were also fewer native men. I will likely never know exactly what my Scottish family men did, or why. I imagine it was a mixed bag. I’m happy to clarify that I spoke at the conference as an historian of Glasgow and the New World. My paper specifically addressed ‘Macdonald’s Glasgow’: social and economic conditions in the city, 1815-1820; the ‘push’ and ‘pull’ factors that encouraged many Scots to emigrate to the Canadas in this period; arrival ports and numbers of emigrants as well as the specifics of the Macdonald journey in May 1820. As I stated at the conference, I am NOT a specialist of Scots in Canada and I did not address Macdonald’s career post 1820 or indeed his contemporary legacy today. Thanks so much for this important article. Great history for us to have, and also wonderful to hear about your ancestor and his efforts to help the First Nations of Canada. This should go viral, hope it does.